This morning NJSEA staffers were busy at Harrier Meadow mounting and installing Tree Swallow nesting boxes for the beautiful, magnetic blue spring migrants who have started to appear in the Meadowlands. They have arrived a bit earlier than normal thanks to the warm weather. In addition to our photos from this morning, we’ve included file photos of Tree Swallows outside their new homes. 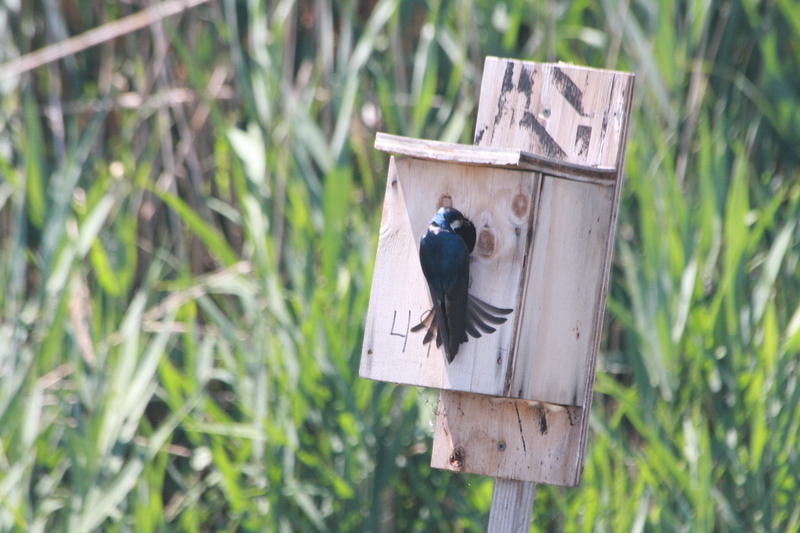 Tree Swallows migrate to the Meadowlands by the hundreds every spring and our naturalists are busy installing dozens of nesting boxes around the Meadowlands District in our marshes and the Hackensack River. 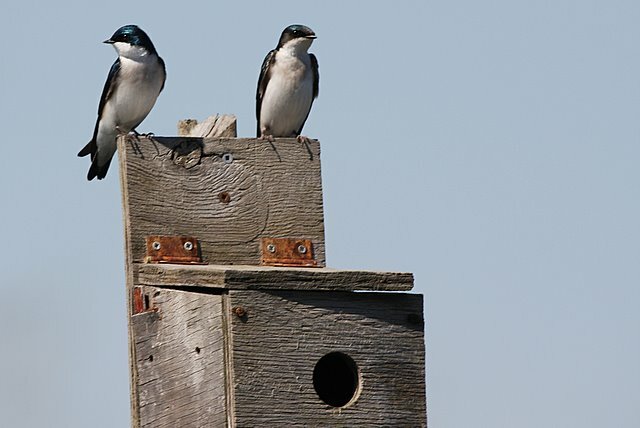 The Tree Swallow is a secondary cavity nester, which means it must have the use of dead trees to nest in, and it must have a hole that has been excavated by a primary cavity nester. Loss of habitat and competition for nest sites from other bird species are part of the reason why we provide these vital nest boxes for these birds. The Tree Swallow (Tachycineta bicolor) is a small, beautiful bird about 5 ½ inches in length and has a metallic blue or blue-green upper part and a white under part. Tree Swallows are one of the first swallows to migrate back to this area for the spring nesting season. 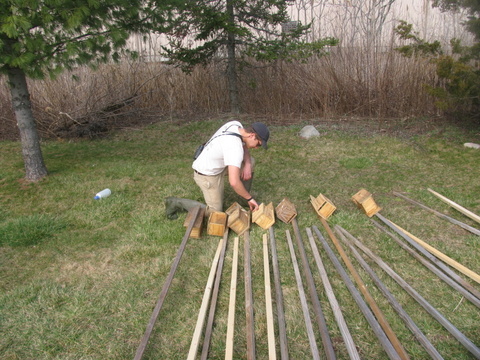 Hundreds of pairs can be found around lakeshores, streams, flooded Meadowlands and marshes. 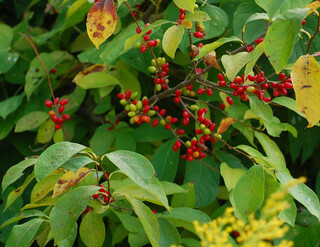 March is the time of year when gardeners are just itching to get outside and get their hands dirty. Today I noticed my Honeysuckle leafing out and even saw the buds ready to pop on my Serviceberry. The Red-Winged Blackbirds have been back for a few weeks now, filling up my yard with their O-ka-leeeee call. I know spring is just about here. Along with the return of many of our favorite birds, spring also means it is time to think about creating or improving your backyard wildlife garden. As more land is lost to development in New Jersey, our backyards will become even more important in the fight to maintain biodiversity in the Garden State. In suburbia a healthy backyard free of pesticides and insecticides along with a good variety of native plants may mean survival for many of our butterflies, migratory birds and pollinators. A very wise friend of mine once said, “Trying to pick a favorite plant is like trying to pick a favorite grandchild.” It’s just about impossible .“ But since many folks I talk with get a little overwhelmed when trying to pick plants to begin a backyard wildlife garden, I thought I would attempt to pick out a few of my favorites.